I used to own an E39 sedan that had an "M" package with wheels, tires, shift knob & steering wheel. What else was included in that package? That is the complete list, as far as I know. I have a 1997 540 6 speed manual. It has the chrome trim around the windows, 235's all around, 4-spoke steering wheel. It sounds like I do not have the sport package? I thought ALL 540's came with the sport package. How can I tell for sure if it has the sport package? package does have a bit "rougher" ride. My brother had a 1997 540i E39 with the sport package. His included shadowline trim, a sports suspension (the car was lower than usual), and it had a more aggressive bumper or spoiler, I can't remember which. He had the 4-spoke steering wheel though. The 3-spoke steering wheel didn't come out till 2000. I'm guessing I don't have the sport. I email the dealer my VIN and asking him to confirm. Sport packaged E39's are hard to come by these days. Most owners are holding on to them. I would say my E28 has 1/2 sports package, I have have bavauto springs, bilsteins sport shocks and a front air dam! 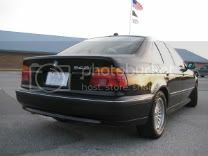 However, no 3 spoke wheel, I have 15 inch basketweaves from my E34 that got totaled and no shadowline trim. I've converted all my head lights to HID and tail lights are all halogen. If you're interested let me know. Wait a minute. That is an M5, but you said it didn't come with "the visual Actributes". Is that an M5 clone 525i, 530i or you are just pulling our chains? Nice pics by the way . By no means am I trying to pull it off as an M5. As you can see the is no M5 badge on the trunk. Plus the mirrors are not M5 style nor do I have the trunk spoiler. By no means am I trying to pull it off as an M5. Slap a badge on there and somehow fabricate the fender grille thing and you would have an easy time fooling people with. Okay, maybe swap the mirrors too. I seriously thought that was a stock photo at first. Boy, that car shore is purdy. E39Chris525i managed to pull it off; Euro front plates AND NY plates on at the same time. That is right . Its also on the 325xi. The cops haven't bothered me at all. I had the same set up on my 92 535i. When it got hit, it shattered the BMWCCA badge and knocked the euro plate to the ground, though no damage to it. I need to do that set-up on the 528e, though I need to get another euro plate and supports since the front moulding on the E28 supports our lousy USA plates. I should have known that the silver 5er wasn't an M5 just by looking at the side mirrors. Gr8t looking car .